From a bush block to a family friendly resort style holiday park Amberlee has come along way since Ron purchased the land in 1982. “For your family, by our Family” has always been a motto and the Neary Family have also grown along with the business, from the starting family of 4 to a lovely bunch of 24 today. It’s often said that strength comes through adversity and so it’s possible that the success of Amberlee Family Holidays on the Mornington Peninsula evolved from the adversity of a failed Queensland business in the late 1950s. The seeds for what is now one of Victoria’s – and certainly one of the Peninsula’s – most successful tourism businesses might have been sown in the mind of the 10 year old Ron Neary, whose single mother struggled to keep afloat a caravan park she had built from scratch. In 1974 Ron married Viv, a trainee primary teacher, and they settled in the bushland of Warrandyte, on Melbourne’s north-east fringe. By the early 1980s they owned five houses, including their own 40 square hillside home. At 34 years old, when Ron couldn’t have been busier, and Viv was busy with two toddlers, Leeam and Amber, the urge to do better struck at the Neary’s. They scoured Melbourne’s outer southern and eastern areas for suitable land to establish a caravan park. They used the 059 telephone district to set the search boundaries, but it still left everywhere between Healesville, Portsea and Phillip Island to consider for the next chapter of their business life. Perhaps it was Ron’s early exposure to the caravan park industry, or maybe it was holidays on the Peninsula that prompted the search. The popularity of the Mornington Peninsula and the boom in caravanning meant that 22 bush acres behind Rosebud was the answer to what they were seeking. They liquidated all assets to start a new life, living in a caravan and under canvas at the Jetty Road property. There were 32 caravan parks on the Peninsula at the time (now 16 parks). The residential development along Jetty Road thinned out significantly as you moved away from the beach. Many at the time said that a Rosebud caravan park located away from the beach would not work. Indeed, the former Peninsula Gardens, further south along Jetty Road, had closed the year before, but Amberlee’s neighbouring Tudor Caravan Park had operated for many years and Carrington Caravan Park (now closed), in nearby Elizabeth Drive, were both popular locations. Moreover, Ron and Viv didn’t envisage a park reliant solely on the beach trade. They wanted to establish a new style park, in a natural setting, with resort-style facilities, which gave people something to do on a non-beach day, all year-round. It was probably the first resort-style caravan park in Victoria. Not only did they have to convince the public and fellow park operators that they knew what they were doing, but also the bank. Amberlee Caravan Park opened for Christmas 1983. Ron and other family members had worked tirelessly for 12 months to get 40 sites (out of an initial 60 sites) and the recreation facilities ready for the summer season. In fact, Ron and his father-in-law Trevor were still nailing down the lines on the tennis court on Boxing Day as cars and vans started to roll-in. Ron knew from his building career that properties with kerbside appeal were always easier to sell, so he put much effort into establishing the appearance of Amberlee. Rather than viewing a row of vans when guests turned-up at reception, he wanted the bushland and the recreational opportunities to be immediately apparent. While still living under canvas, he and the builders started work simultaneously on the house, the pool, tennis courts and half of the ablution block. He bought a bob cat to do as much of the work himself. A park that would normally have cost $500,000 (1983 dollars) to create, was completed for 40 per cent less than if a contractor had built it, plus a lot of perspiration! But Ron did not want it 40% less he wanted 40% better therefore money saved went into a better holiday property for families. It wasn’t without its ups and downs and like most small businesses the first few years were a real struggle, but as time went on and the word got out about Amberlee business picked up and the park grew along with the Neary Family. The 40 sites soon expanded into the planned 60. In 1988 the Neary’s began adding cabins to Amberlee – initially four, then adding more over the following decade. An additional 60 sites were created during the mid 1990s, by which time more of their guests were making the transition from canvas annexes to solid structures. With an eye to business, and always wishing to improve the amenity of the park, Ron used his building skills to help customers make the conversion. The park began to establish itself as a more permanent holiday venue. Today, only one site in Amberlee still has a canvas annexe and whereas the park used to offer 40 sites for casual use, there are now only two casual sites available – each with their own private ensuite. The transition from tourist to Holiday Park is complete. By 1995 the need for a new style of accommodation was becoming evident on the Mornington Peninsula – self-catering family style units. Ron was quick off the mark. Within a year he had skilfully converted the Amberlee recreation room into four star suites for couples and families. His intuition paid off, because within the first year of operation they recouped their building cost and 20 years later they are still popular with the public. Ron has always subscribed to a ‘10%’ theory. That is, every year he needed to improve the park’s amenities by 10%, so that the customer experience also increased by at least 10%. As a result, the swimming pool has received several upgrades, the tennis courts are now mod-grass, quality playground equipment abounds throughout the property, and the asphalting of roads is a continuing process. There are now 120 sites scattered among the gently rolling sand dunes. With a possible addition of 47 more sites, the layout and vegetation cover of the property will ensure privacy and will retain the characteristic natural atmosphere – hard to find in most modern parks. Future plans include an indoor heated pool with a indoor play room alongside the pool deck, to house a spa, sauna and yoga room. Few businesses are established without some heartache along the way. The Neary’s had a vision, stuck to it in the belief that it was an accommodation product that would not only lift local standards and provide a better tourism experience, but it would provide them with a solid business model. Ron dug his first hole at Amberlee when he was aged 34. The Neary children grew-up in the business. Leeam (born 1980) and Amber (1981) were three and one year old respectively when the park opened. Aaron (1984), Corrine (1986) and Sandy (1990) were Amberlee born and bred. They all enjoyed the company of hundreds of friends among the park’s families while growing up. However, it wasn’t all play, as children always helped out within the business doing everything from cleaning toilets to answering phones and by spending many hours on the bobcat or the ride-on mower. The real success of any family business is often being able to provide a career to those family members who want to continue the legacy. All three of the Neary daughters, Amber, Corrine and Cassandra, now run the day–to-day business, together with Amber’s and Cassandra’s husband’s Syd and Brenton. It’s a family joke that Amber actually began running the business when she started answering the Amberlee office phone at three years of age. She is now the face of the business. The Neary boys Leeam, Aaron and while not directly involved, add their particular skills do assist the business. The Royal Commission into the 2009 Black Saturday bushfires prompted the latest renewal at Amberlee Family Holidays. To significantly reduce flammability of structures, older style solid annexes are being removed, fire walls installed and the landscaping improved to slow the spread of any fire. The Neary’s renewal plan also includes the replacement of structures unable to meet the new standards with purpose-built, high fire-rated custom built Jayco holiday units. Josh is in charge of the design, costing and selling of the new-era structures, while Sandy’s husband, Brenton, is putting his carpentry skills to great use in building the fire walls and creating alfresco decks, which are tailor designed to guests’ needs. Aaron attends to all the park’s electrical needs, including installation of lighting and fans to the alfresco areas. 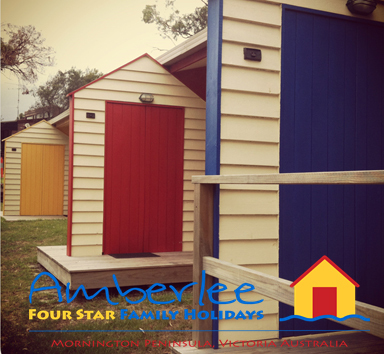 Holiday homes on the Mornington Peninsula are now almost out of reach for the ordinary wage earner, except at Amberlee, where a stand-alone 3 bedroom, 2 bathroom holiday home, snuggled amidst the bushland and featuring all the amenities of a Sorrento property, is very affordable. What’s more, an Amberlee holiday home is within a gated area and looked-after when you’re not there, saving money and creating peace of mind. Thirty years passes very quickly in a busy family business. Sometimes Ron and Viv don’t realise the passage of time until they’re invited to the weddings or 21st birthdays of the children of some of their earliest residents. They realise that they have fulfilled their original ambition of providing memorable family holidays when speeches at those events include references to personal milestones reached at Amberlee, such as learning how to ride a bike, how to play tennis, or perhaps a first kiss. It is then that Ron and Viv realise they have made a difference in people’s lives, and have created a tradition that is now being carried-on by their children. Just recently one of the Amberlee guests, which have been with them from the beginning, had a baby becoming the fourth generation of the one family and holidaying at Amberlee since 1984. Look How Much We have Changed!